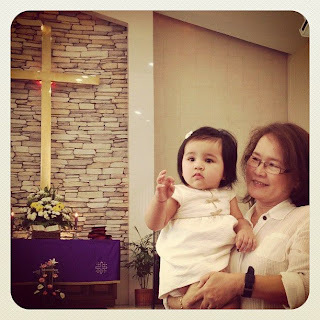 Tabby was Christened on March 10, 2012. I thought of the date as it was a day before my birthday. The affair was a quiet one, with just a few relatives and friends invited But! Hello!? There were close to 40 sponsors! I actually thought it was a joke but what can I do? Anyway, the baptism and reception were held in a private function hall so the following week, I had to take Tabby to my hometown church so she could be presented to the congregation as newest member. Welcome to the Christian World sweet Tabby!